Rest Day 1/31/13: Who would win in a 2k – Joe Flacco or Colin Kaepernick? 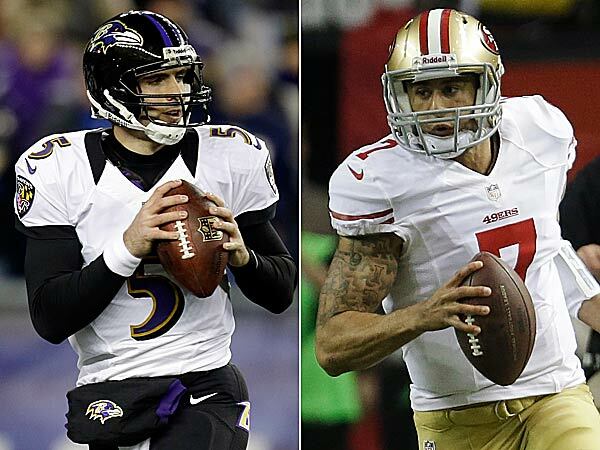 Who would win in a 2k – Joe Flacco or Colin Kaepernick? As we prepare for the big game this weekend it’s fun to think of how elite athletes, playing in one of the World’s biggest games, would fare on a Concept2 Ergometer. Who knows, perhaps they use them in the off-season for cross training? Both quarterbacks are well over 6 feet tall and 220+ pounds. I imagine they could pull some low numbers with a bit of technique. Who do you think would win and where will you be watching the game? Let us know! This entry was posted in Rowing by Renegade Rowing. Bookmark the permalink. This was a tough one. I looked both of their stats up, Flacco is 2 inches taller and only 10lbs heavier and 5 years older. I was going to go with the young stud, but I know for sure that the extra size means a longer pull and push and with a little extra weight behind those pulls, my bet would be with Flacco. Watching the game at home with some wings! I prefer watching at home because Im one of these geeks that love the commercials and I can’t hear them in a crowd. Going for the Ravens but they have an uphill battle. The Niners are tough. Love the reasoning Larry! I’d say Flacco as well. Hey Coach, just wanted to pass along my psuedo-RR rest day wod: 500m row, 21-95lb s2o, 21-1.5 kbs, 750m row, 15-115lb s2o, 15-1.5 kbs, 1000m row, 9-135lb s2o, 9-1.5 kbs. 15:04. Did Amanda yesterday at 9:25 and Gwen the day before at 165lb. Feeling good! Solid Larry! Make sure you’re putting an equal amount of time into mobility and include a rest day once or twice a week. Keep it up!